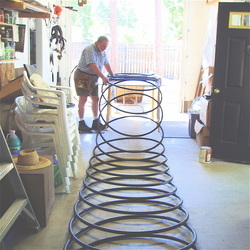 (Left) Bill ties his favorite horizontal underground loop deployment method, the Slinky coil. It gives maximum pipe density underground for the best heat transfer. 36" diameter Slinky coils with 15" between the loops consumes 800 feet of high density polyethylene pipe. Here, after tying with wire, it exits the jig on the way to a trench. (Above) For Bill, sharing ground source technology with others is as good as it gets. This display was at Plumas-Sierra Rural Electric's Energy Expo, 9-10-11. This Web site attempts to share energy efficiency information and encouragement. Consulting services can also be arranged for a fee. I am not a salesperson or a contractor. Feel free to submit a question or comment about the purpose and content of this Web site. All responsible email will be answered. Best wishes for success with your energy education, construction project, or retrofit choice.